Today, July 15, 2016, we mark 100 years legacy of Elie Metchnikoff (May 15, 1845 – July 15, 1916). 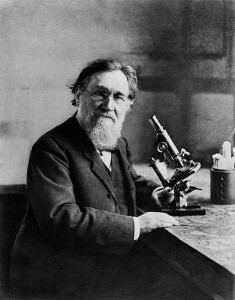 In addition to his ground-breaking achievements in immunology and embryology, Mechnikoff may be well considered the founder of modern scientific aging and longevity research, having proposed some of the first scientific theories of aging and some of the first science-based methods of intervention into degenerative aging processes as diagnosable and treatable medical conditions, and having coined the discipline of “gerontology”. There is a tradition to celebrate the anniversaries of great persons (scientists, artists, writers, politicians, generals) to promote the area of their activity and popularize their ideology. It may be hoped that marking Metchnikoff’s legacy can serve to promote and popularize the science and ideology of healthy life extension, ameliorating aging-related ill health. Last year, on May 15, 2015, in honor of Metchnikoff’s 170th birthday anniversary, there was held the international “Metchnikoff’s Day” campaign, with meetings and publications in several countries, in support of biomedical study of aging and longevity. This year, Metchnikoff’s 100 years legacy, apparently is only marked in one place in the world – in Dvorichna settlement, Kharkov area, Ukraine, Metchnikoff’s birth area – where today Metchnikoff’s Museum is being inaugurated, with a special conference. Yet we also seize this opportunity to once again honor the founder of modern longevity science, and use this occasion to emphasize the importance of this type of research for the global aging population. Looking forward to additional opportunities to emphasize this importance (for example during the forthcoming Longevity Day/Longevity Month campaign in October, following the UN International Day of Older Persons on October 1 http://www.longevityforall.org/longevity-day-and-longevity-month-october-2016/ ). For your consideration, here are some additional materials on Metchnikoff’s day in 2015. And more materials on the history of longevity science, including Metchnikoff’s foundational legacy.